The Main Dolomite is a primary rock formation in the limestone Alps and one of the oldest types of rock in the Allgäu Alps. deepest, when the fold mountains were formed, it was pushed up on top of all newer earth and rock layers. As such, the Main Dolomite today forms the hugely rocky and impressive peaks of the Allgäu’s central main ridge from the Hochvogel to the Biberkopf and Widderstein. Also characteristic of the Allgäu Alps are the extremely weathering resistant aptychi layers. Together with the spotted marl limestones, which are also extremely long-lasting, these were raised up during the creation of the Allgäu Alps and modelled through the weathering of the softer rocks that surrounded them. 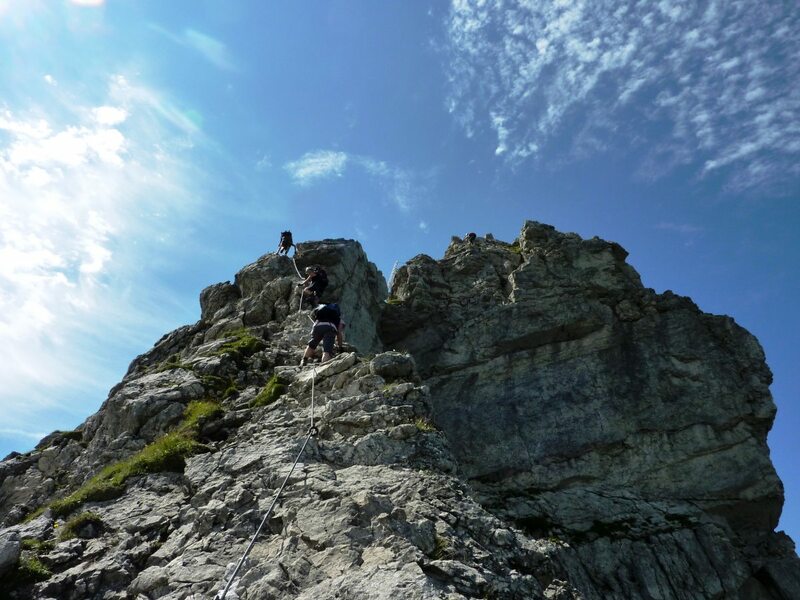 Especially in the case of the summits and rugged mountain ridges of the Höfats and the Schneck, this resulted in the mountains that are characteristic of the Allgäu Alps. 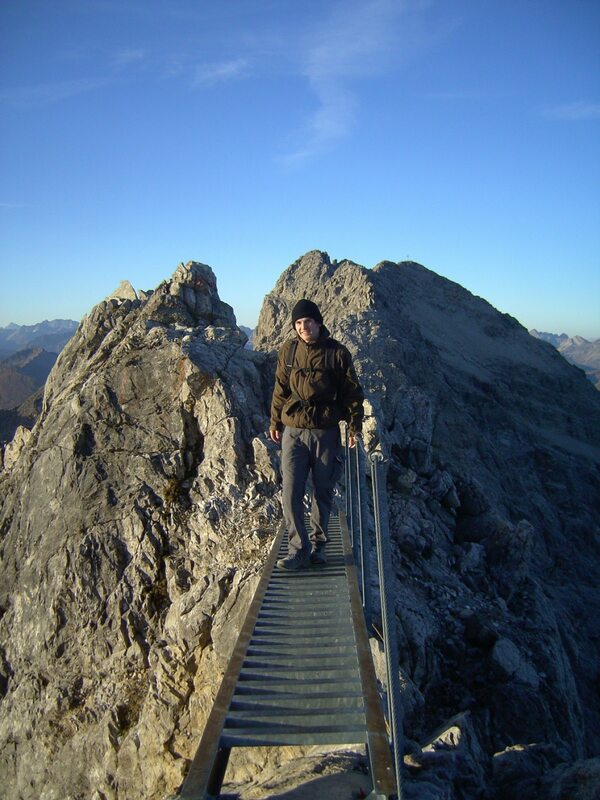 Nowhere else can these kinds of summits be found as predominantly as in the Oberstdorf mountains. From the Rappenseehütte, the Heilbronner Weg climbs the large stone col to the Wiesleskar Cirque. A winding trail then continues upwards. On finally reaching the rocky terrain of the Hohes Licht, you may need your hands for support for the first time. The steep climb leads to a rock ledge on the east face of the Hohes Licht before continuing uphill at a slightly more leisurely gradient. Several exposed or difficult sections are equipped with steel cables for your protection. After a few more metres, the route continues uphill to the small stone col. After a little aluminium bridge, the route becomes embedded in the rock once more and heads downhill towards the Socktalscharte where you will find an emergency descent route to the Waltenberger Haus. From the col, the route winds its way up to the summit of the Bockkarkopf. The rugged and rocky descent from the Bockkarkopf once again requires a great deal of concentration and sure-footedness. 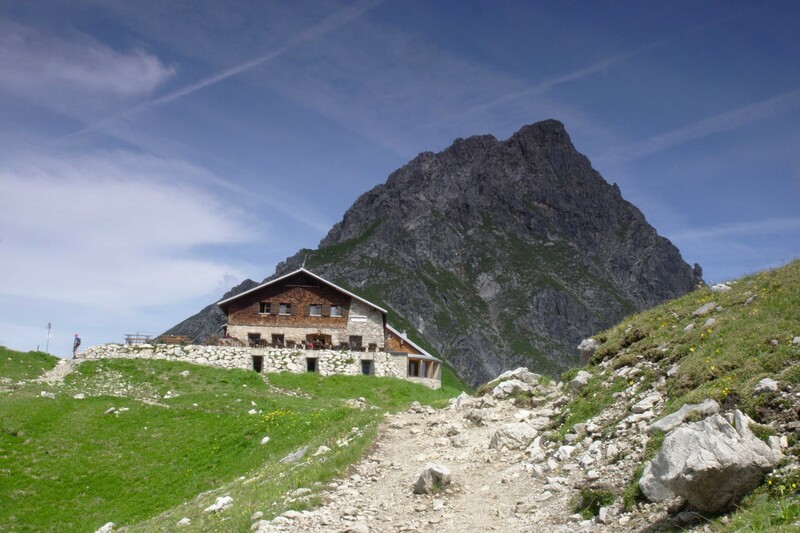 The more demanding section of the Heilbronner ridgeway ends at the Bockkarscharte, from where the route continues along gentler terrain over the Schwarze Milz and the Mädelejoch to the Kemptner Hütte. Join a guided tour offered by the local mountain schools for better safety, better company and a better experience! route over the Kleiner Daumen and the Rotspitze to Breitenberg above Hinterstein. The route starts from the Nebelhornbahn middle station. 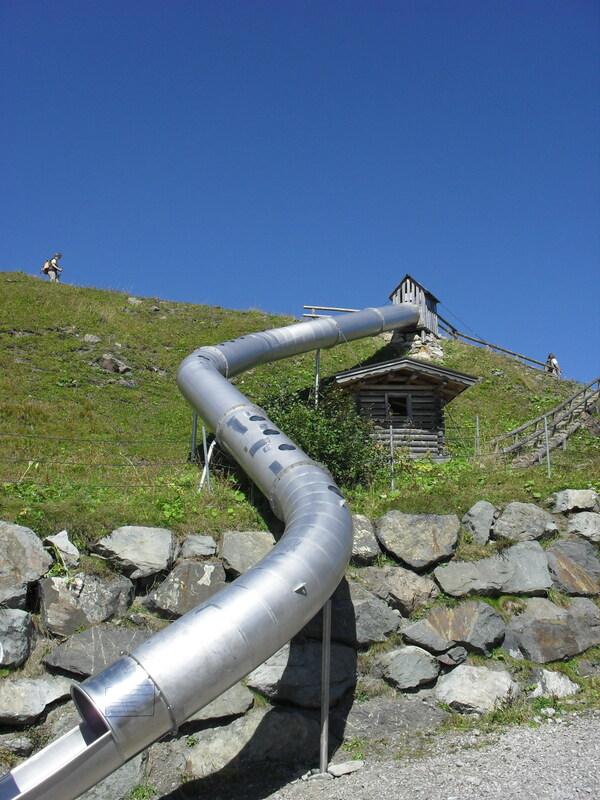 can be climbed via the Faltenbachtobel Ravine to the Seealpe. 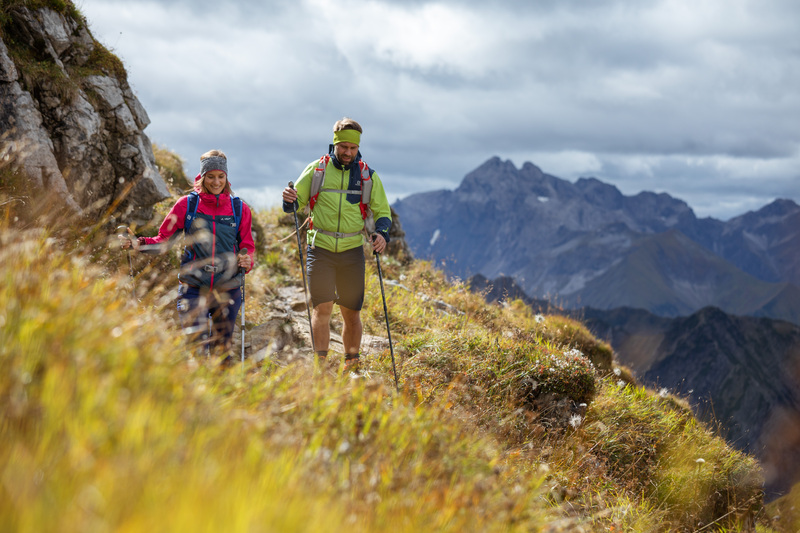 The ascent to the summit takes you across the Roßbichl’s flowery mountain meadows before steeply winding its way up to the arête. The last few metres to the Niedereck involve a strenuous climb through dense mountain pines with steel cables for your protection. On reaching the arête, continue uphill to the summit of the Rubihorn. Several slightly exposed sections are equipped with protective steel cables. 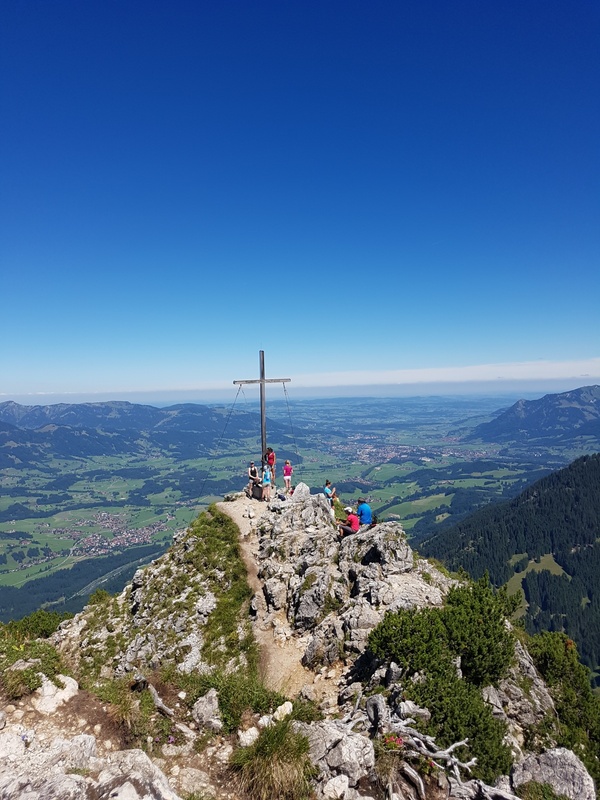 A fascinating panoramic view of the Allgäu Alps awaits you at the summit! The descent starts by returning a short way below the arête before heading down initially very steep slopes to the lower Gaisalpsee Lake. This invites you to stop and fully enjoy the spectacular mountain scenery from your still high-up position. 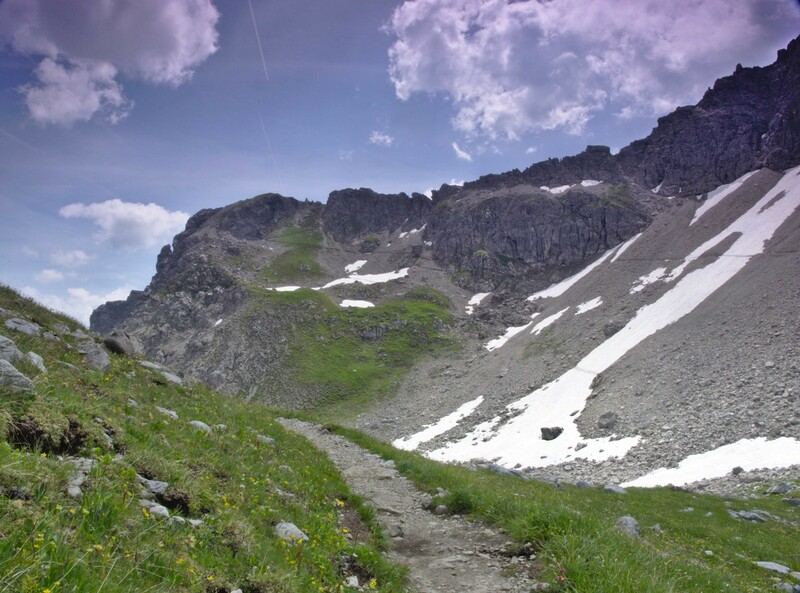 Below the mountain lake, the route descends down a steep and slightly rocky pass to the charmingly situated Gaisalpe. 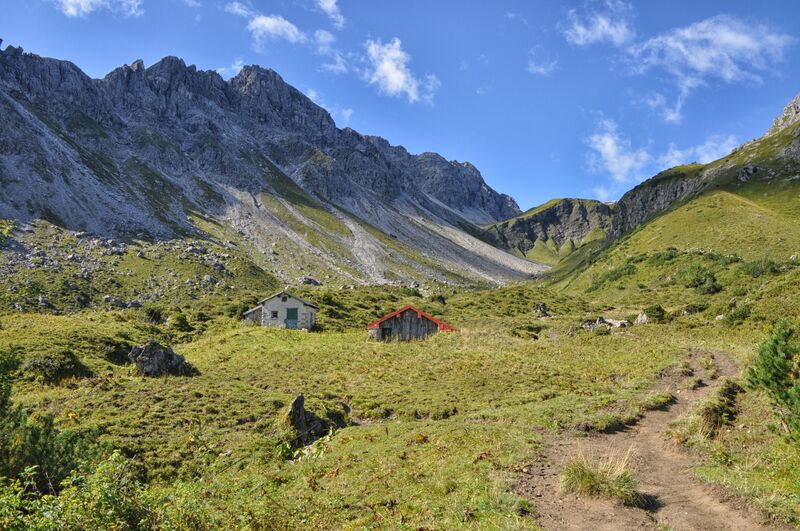 From here, follow the Wallrafweg trail along the west side of the Rubihorn back to Oberstdorf. If you want to descend straight back into the valley, you can alternatively take one of two possible descent routes to Reichenbach. The ascent on the Fellhornbahn cable car gets a large part of the elevation gain out of the way. If you don’t want to miss out on the Fellhorn summit, stay on the cable car to the summit station. If you do so, however, you will have to start the mountain tour with a short downhill section. Kinder on the knees and still with wonderful views is the route from the Schlappoldsee middle station via the Bierenwangalpe hut. Away from the well-developed hiking trails that connect the cable car stations, an Alpine climb surrounded by flowers leads past the ruined Roßgundalpe and the Kühgundhütte (not serviced) to the Fiderepasshütte. 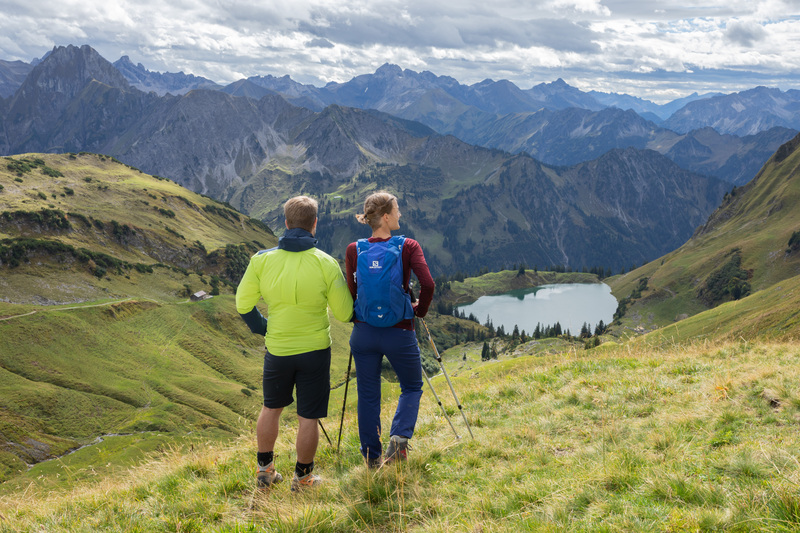 Far-reaching views into the Stillachtal Valley and over many of the summits in the Allgäu Alps remain your constant companions. Although the ridgeway initially climbs gradually, the final section to the hut gets slightly steeper. Here, the route snakes its way upwards over scree. On reaching the shelter, you shouldn’t miss the great food. The Fiderepass marks the border between Germany and Austria. The descent on the far side of the pass offers views of the mountains in the Kleinwalsertal Valley, especially of the Hoher Ifen and Gottesacker plateaus. If you don’t yet want to descend, you can take in another summit via the serviced Kuhgehrenalpe hut. On returning to the cable car area, the Kanzelwandbahn will take you back into the valley. Alternatively, descend via the Fluchtalpe hut, down one of the easiest hut trails in the Allgäu Alps.